I have been on the look out for a brown suede skirt since they appeared on the fashion scene last spring, but every one I kept finding was too short for my comfort zone. So you can just imagine my excitement when I found this gorgeous, studded, brown, suede pencil skirt! I did have a bit of a struggle styling this skirt. 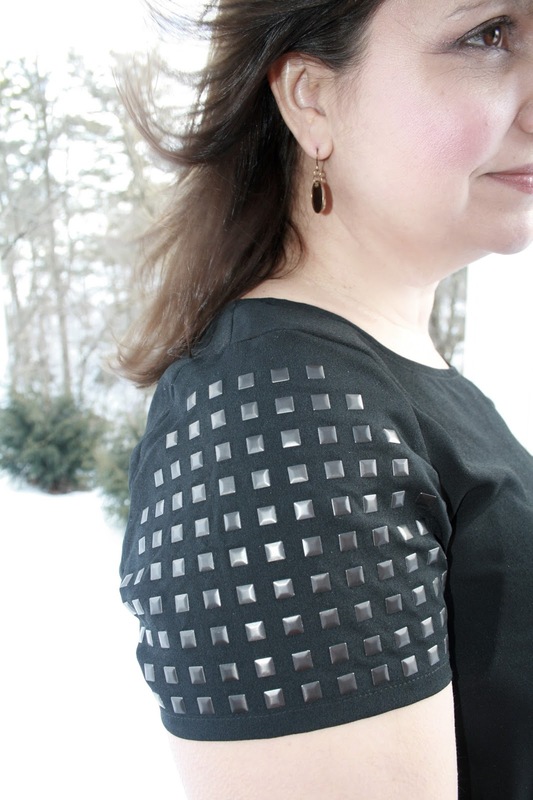 I ultimately chose a black top with studs, that echoes the studs in the skirt and I wore a black faux leather jacket as my outerwear since it was a warm winter day. Although I find pencil skirts uncomfortable to wear, they are definitely figure flattering. The skirt is new, I bought it from Steinmart while vacationing in Florida. The top is old, I bought it this past fall and showed it to you in THIS POST. My vinyl snakeskin print bag I also picked up on clearance at JCP years ago. I absolutely love the studs in the skirt, however, they do make styling the skirt a challenge because you must tuck your shirt in if you want the studs to show. I had two other tops I preferred wearing with this skirt: a peplum top and a dolmen sleeve top, but they both covered up the studs on the skirt. For jewelry I wore black and gold bracelets, and brown and gold drop earrings. And now, here are more ways to style a brown suede skirt from Pinterest! Pair it with a white blouse and pretty scarf! Wear a Denim Jacket and Striped Shirt! Wear a Black Fur Vest with a Brown Suede Skirt! 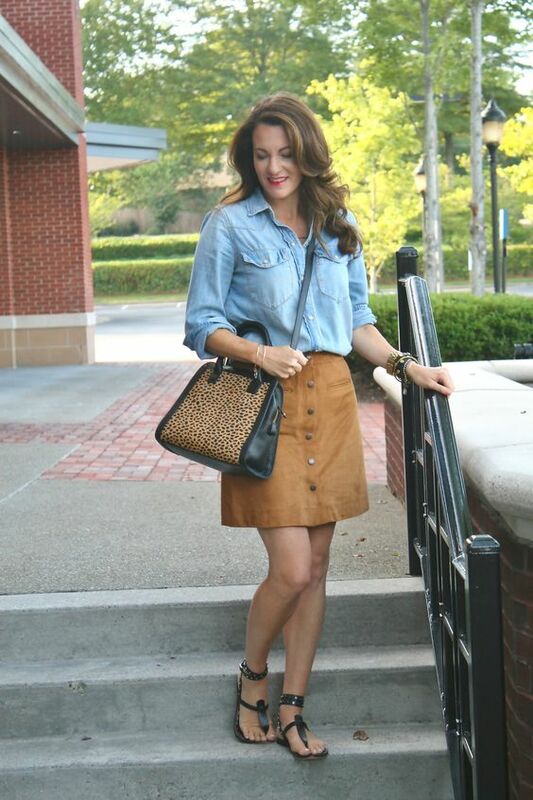 Wear a Brown Suede Skirt with a Chambray Top! Go for a Boho Vibe with a Fringe Cardigan! So what about you? Have you purchased a brown suede skirt yet? 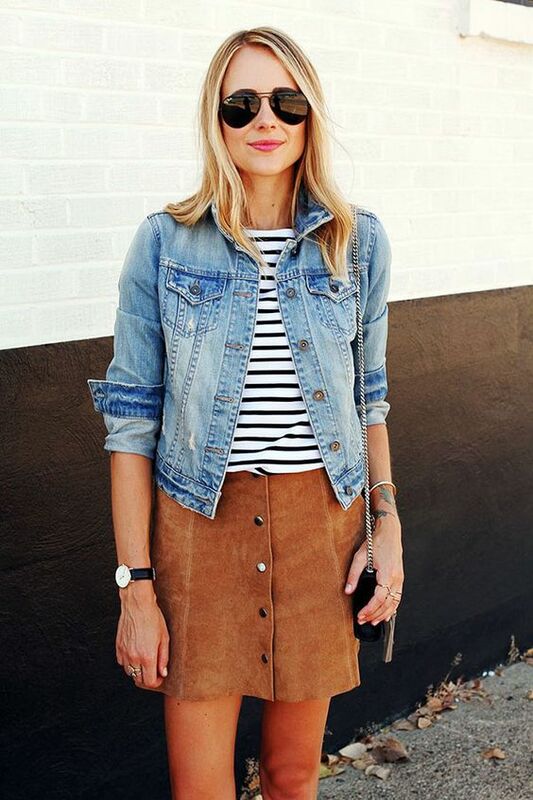 How do you style your suede skirt? I'd love to hear from you! Nice skirt! It looks great on you! And it's a nice length; all the suede skirts I've come across have been very short... The studs on your skirt are great details! Loving the stud details in your outfit! And the inspiration you pulled is great. The stripes and denim jacket is totally up my alley! I have been looking for a brown suede skirt, too! I really like the ones with buttons on the front and the scalloped one you have pictured. Going into the spring you'll have a lot of fun styling it, too! I would want a longer length like yours, too. Love how you styled it, the studs on the shirt and skirt go great together! I think the suede skirt looks great with black! Also love it with that striped top you showed for inspiration. WHat a great skirt! The textures and details in your outfit really take it over the top! Such a great skirt! I love how versatile suede is & how easy it is for people of all ages to wear. Lots of great ideas. This would be a perfect addition to my workwear link up! Thanks for linking up with me last week! Sorry for the delayed comment, I'll be pinning this to the linkup board!